It’s hard enough to build a product that customers want to buy. But when your pricing structure acts as another hurdle holding potential customers back, you know you’ve got a problem. For years, our pricing had been on a fast moving train to Complexville – we added products, scaling factors, and more options until we found ourselves in a position where customers were frequently asking us questions before they could even understand how much GoSquared would cost them. We love simplicity, and it’s core to our plans and focus for 2018. After being inspired by a few of our friends, we decided to bite the bullet and simplify our pricing towards then end of last year. Our old pricing page wasn’t necessarily ugly – in fact we were quite proud of the visual design of this section of the site. But the number of options was overwhelming. And adding to an already large number of choices, clicking on any plan “box” led to a second screen with more options and sliders. It was a challenge to just get to a point where you confidently knew how much GoSquared would cost. Because we had multiple concepts to grasp, you had to understand a few key terms that were unique to GoSquared before you could even calculate your own price, and then you’d need to understand your own usage volume of those metrics. All in all, calculating your price was not a simple task if you weren’t already using us – which was a barrier for new people who were otherwise keen to try us out. 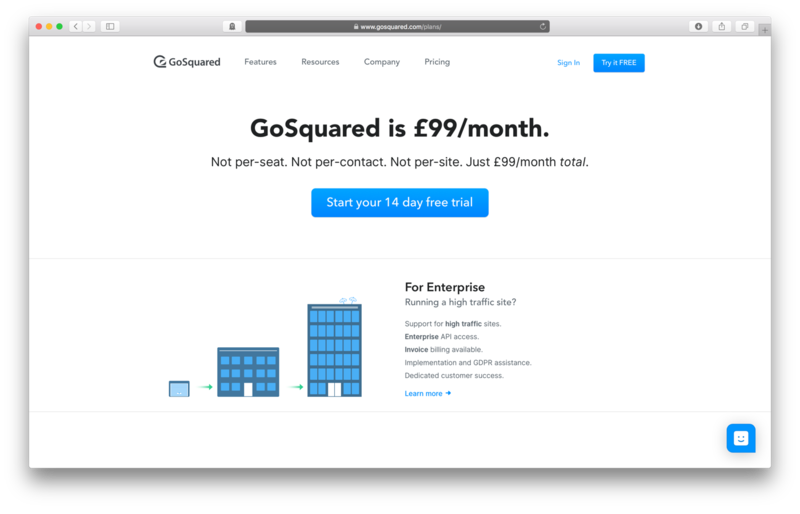 Because calculating your price was hard, potential customers couldn’t be swayed towards using GoSquared when we worked out more affordable than their existing setup. Even though we’d often work out more affordable than using a separate live chat tool, CRM, automation tools, and analytics, the complexity of our pricing structure made it hard to see. Because it was so hard to understand what you’d pay, pricing became a stumbling block – you’d have to ask us how much GoSquared cost, wait for a response, or have an extended conversation to understand what we’d cost today, and your cost would be as you’d grow. This is the way pricing works for many other tools in the marketing and sales world – they all get more expensive as you use them more. With our old pricing, your costs would potentially increase dramatically as you expanded usage and grew. Sometimes this made sense, but often it was a real problem for customers who were otherwise happy with us. What’s worse is it made customers afraid to make more use of GoSquared – it held them back from buying into GoSquared 100%. Our new plans and pricing page focuses on our core self-service plan with one simple price. We’ve turned a tricky question into a problem that just doesn’t exist any more – unlike most software, we now have one obvious price tag. There’s no question other than “do you think it’s worth it?”. Since simplifying our pricing, when you start using GoSquared you have no fear that greater usage will cause you to spend more – you’ll keep paying just one simple price, regardless. 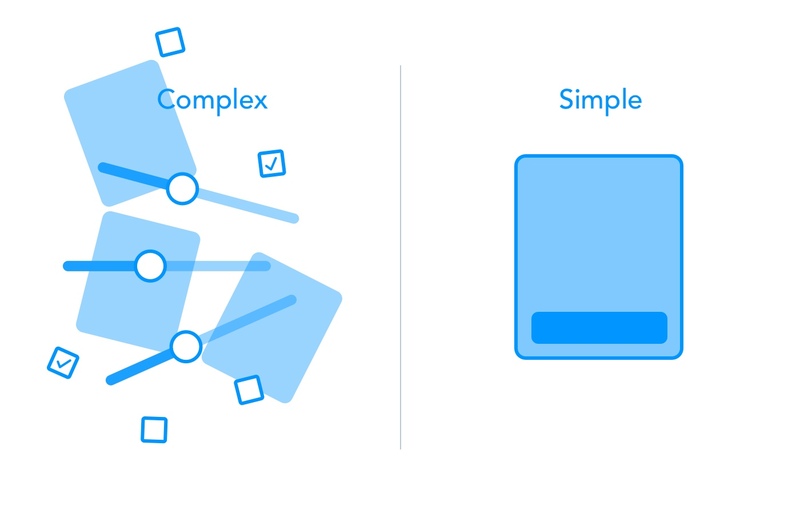 Everyone else in our space has more complex pricing that gets more and more expensive as you grow. 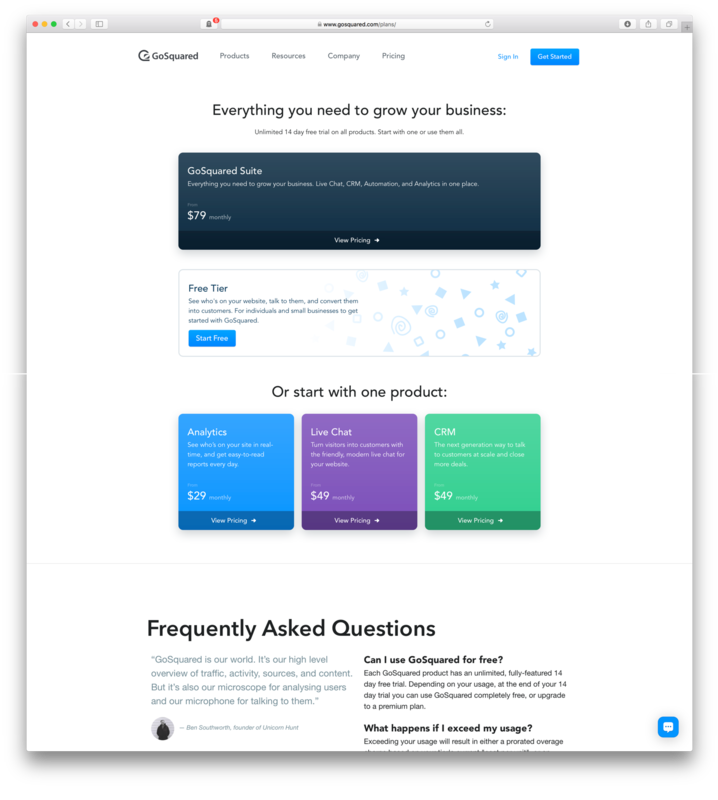 If you’re looking for a platform that will help you transform your online marketing and sales efforts, you can pick up GoSquared for one simple price today. It makes the whole process of selling GoSquared to new customers easier and clearer than ever. Importantly, it’s also easier than ever to establish how many customers we need to hit our goals. When every customer is worth a fixed, predictable amount, we can do very simple maths to understand how many we need to grow this year. We’re still establishing the pros and cons of simplified pricing, but the improved clarity has already bene paying dividends. We can’t wait to simplify more of the business and the GoSquared platform as 2018 progresses.